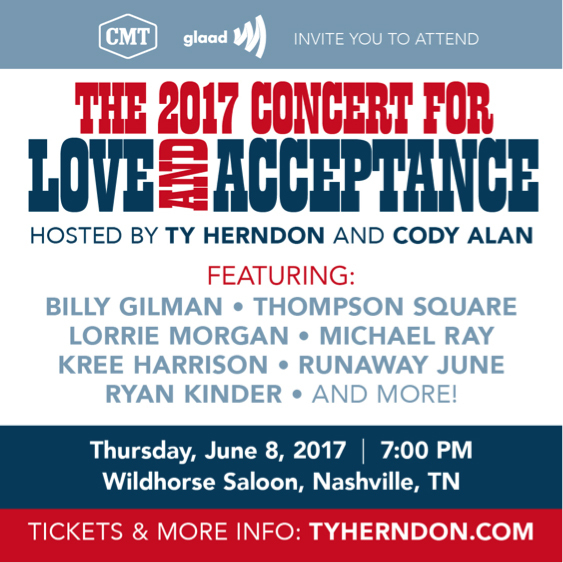 Ty Herndon is making a statement about inclusiveness with his second Concert for Love and Acceptance taking place at the Wildhorse Saloon in Nashville on June 8, during CMA Music Festival. The event, hosted by CMT’s Cody Alan, supports the LGBTQ community and at-risk youth, a cause close to Ty’s heart. The singer revealed he was gay in 2014, at the age of 52 and held the inaugural concert in June of 2015. Artists announced for the event include Billy Gilman, Kree Harrison, Ryan Kinder, Runaway June, Lorrie Morgan, Michael Ray, Street Corner Symphony, and Thompson Square, with more to be announced at a later date. Doors open at 6pm, red carpet begins at 7pm and concert begins at 7:30pm. Tickets, range in price from $25 for general admission to $100 for VIP tickets, are on sale now and can be purchased at Wildhorse Saloon’s website.